Opposition supporters attempted to march to the offices of the Tribunal Supremo de Justicia (TSJ) [Supreme Court] in Caracas today, and were met with the same kind of repression that has prevented them from marching into western Caracas throughout the last month. During the repression, a 27 year old protester named Miguel Castillo Bracho was hit in the throat by a “projectile” and subsequently died. Bracho was protesting in Las Mercedes, Caracas when he was killed. Another man, Anderson Enrique Dugarte, died in Merida state this afternoon after being shot in the head during a protest in that state on Monday. The demonstration today developed with the same rhythm as virtually every other opposition demonstration that has taken place in the capital city since early April. Opposition supporters rallied at eight different points of the city starting at around 10:00 AM this morning, and then attempted unsuccessfully to enter western Caracas by marching on the Francisco Fajardo highway. The name of today’s march was “Nuestro Escudo es la Constitucion” [Our Shield is the Constitution], and it featured a relatively new and emerging protest tactic: shield-bearers. Shield-bearers have become a common sight at protests, particularly in Caracas, over the last few weeks. 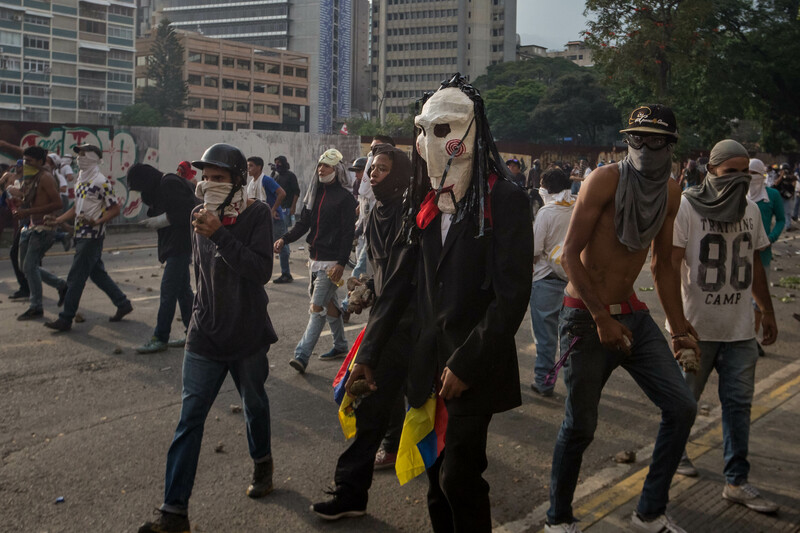 Shield-bearers are protesters who carry home-made shields, often made of wood and scrap metal, on which they write anti-regime slogans or paint Venezuelan flags. The shield-bearers tend to be younger protesters who rush to the front of marches and form shield walls. The shield walls are typically formed by a front rank of kneeling protesters who hold their shield perpendicular to the ground, while a second rank of standing protesters complete the wall. A large enough shield wall appears to be an effective defensive tactic against tear gas and rubber bullets, which the authorities often fire directly at demonstrators. ¡BATALLA CAMPAL EN LA AUTOPISTA FRANCISCO FAJARDO! A 27-year-old man named Miguel Castillo Bracho was killed while protesting in Las Mercedes, Caracas when he was allegedly hit in the throat by some kind of projectile. The projectile was likely a tear gas canister. If Bracho was indeed killed by a tear gas canister, he would become the second protester to die from the projectile since the protests began in April. On April 26, a 20 year old named Juan Pablo Pernalete was killed by authorities when he was hit in the chest by a tear gas canister fired at close range. Bracho becomes the 46th person to die due to the ongoing unrest since April 6. Protesters in the La Candelaria neighbourhood of Caracas lived through tense moments today as a colectivo armado (pro-regime militia) robbed a journalist and then fired their weapons into the air in the early afternoon, sending demonstrators fleeing in panic. Man Recording: They’re robbing and shooting into the air. The colectivos are robbing our driver. Here is the National Bolivarian Police–they’re not doing anything. The colectivos are robbing our driver, they’re taking his bulletproof vest. Here is the National Bolivarian Police taking the bulletproof vest away from them. They’re shooting, as you can see. [To the driver] What did they take from you? Man Recording: The bag! [To the police officer:] The bag! That’s a colectivo, man! That’s a colectivo! The colectivo have just taken our bag. They have weapons and are firing them, as you can see. They keep firing their weapons and the National Bolivarian Police were unable to do anything about it. I repeat: alleged colectivos firing their weapons, and you can see how the National Bolivarian Police were unable to do anything about it. They robbed our driver from CaraotaDigital.net. In an unprecedented move, the militia attack was confirmed by the authorities. The chief of the National Bolivarian Police, Brigadier General Carlos Alfredo Perez Ampueda, spoke to reporters in the mid-afternoon to defend the job his officers had done in La Candelaria against the colectivo. Calling the militia members “bums”, a frustrated Ampueda conceded to reporters that the colectivos are better armed than his officers, but that they would “capture them wherever we see them”. Brigadier General Ampueda’s becomes the highest-ranking regime official to acknowledge the existence of the colectivos armados as violent agents of repression. National Assembly deputy Juan Miguel Matheus announced today that at least 35 protesters had been “kidnapped” by National Guard soldiers in the El Trigal neighbourhood of Valencia, Carabobo state during protests in the area today. Carabobo state is currently under a kind of martial law that the regime calls Plan Zamora, an initiative it has allegedly taken in the name of restoring order to the state. Since coming into effect last week, Plan Zamora has processed at least 251 protesters through military tribunals–a move that is wholly illegal–54 of whom have already been sentenced to prison. The growing use of military tribunals to try civilians demonstrate the absolute determination that Venezuelan authorities have to choke the growing protests and terrorize any individual contemplating the possibility of expressing their opinion. 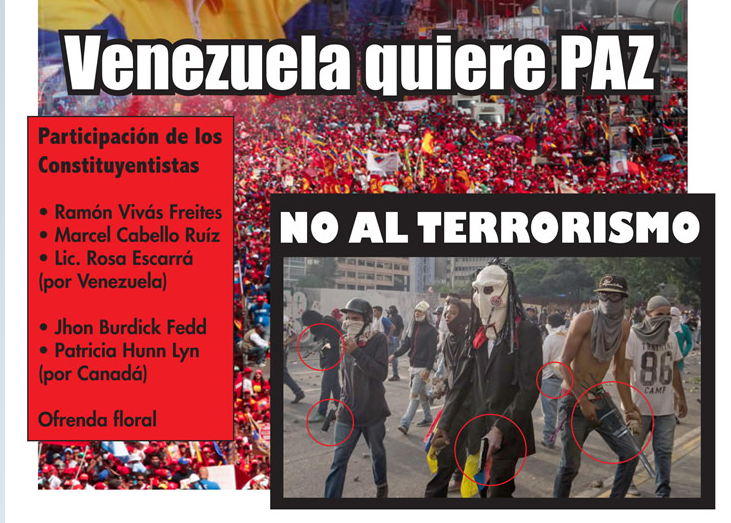 Last night, the Venezuelan consulate in Toronto advertised a pro-regime event in the city by using a poorly-doctored image of opposition protesters. Close examination of the image reveals that all of the firearms seen in the picture were photoshopped. News of the fake image made a splash on social media this morning, and was reported on by a couple of local Latin American news outlets. The Venezuelan consulate later changed the offending image without apology or explanation.